Parsnips get a bad rap. They look like insipid carrots and many feel that they don’t really like them, even if they’ve not given them a chance. Thankfully my mum shared a wide variety of veggies with my sister and I from a young age and I love them all. Some more than others of course, but parnsips, squash, broccoli and even brussell sprouts are my friends. Parnsips are inexpensive to buy and incredibly versatile. Almost any recipe calling for carrots can use parsnips instead. Of course, you can boil them and roast them but did you know you can also eat them raw? Here are a couple recipes I’ve played around with over the weekend. Let me know what you think! 2 apples (raw with skin left on) I like a sweeter apple like Gala, Fuji, Courtland or Ambrosia but you could choose your favourite instead! Peel and chop ends off of carrots and parsnips. Then continue using the vegetable peeler to create long strands of carrot and parsnip, until you get to the core. If this is at all woody, do not use in the salad (See Tip, below). Wash, and core apples. Cut into small bite sized pieces. Add to carrots and parsnips. Using a fork, whisk the maple syrup, olive oil, lemon juice and salt and pepper together until emulsified. Pour over carrots, parsnips and apple and toss well. Ideally, it is best to let this rest for about 30 minutes to one hour before serving. Before serving, sprinkle with chopped walnuts. 1 pound parsnips (500 g). Approx. 3-4 parsnips. Peeled and chopped into even sizes. Tip: If you have large parsnips, cut out the woody core. 1 pound (500 g) yellow or white potatoes. Approx. 3-4 potatoes. Chopped into even sizes approx. 1 inch cubes. It is your choice if you decide to peel them or not – peeling makes for smooth mash and keeping the skin adds extra fibre. In a large saucepan, melt 2 tablespoons butter over medium heat. Add parsnips and cook, stirring occasionally until they begin to soften, about 5 minutes. Add potatoes and cover veggies with water. Cover the pot and bring to a boil. When boiling, reduce heat and simmer about 20 minutes, until parsnips and potatoes are very tender. Drain water using a colander. Return parsnips and potatoes to the pot and mash until desired consistency. Alternatively, move to stand mixer to mash. Add remaining 2 tablespoons butter and the milk, and combine well. Season with salt and pepper as desired, and serve immediately. Tip: The smaller the veggies are cut, the faster they will cook. 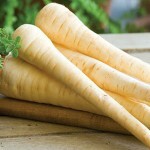 For more info on the nutritional benefits of parsnips, check out http://www.healthbenefitstimes.com/health-benefits-of-parsnips/ (where I also sourced the lovely parsnip photo). Next Post Do we need to take vitamins to stay healthy?